This program is designed to deepen our relationship with the Lord through Bible studies for all age groups. We purpose to reach those within the community, to impact the younger generation for Christ, and empower our witness by strengthening relationships within the GCA family. Each Tuesday evening, a nutritious meal will be served allowing you to bring your family and leave the cooking to us. Dinner is free; however, a free-will offering basket will be made available to help cover the costs. We invite you to join us for an in-depth study of this book as we learn why the Gospel of Jesus Christ is so different from any other gospel, and explore together, ways to share this Good News with others. You will profit greatly as we explore Bibliology, Theology proper, Christology and Pneumatology. Whether or not you’re familiar with these terms, you are sure to be blessed as you come with an open Bible and an open heart. We will study Paul’s prison epistles; letters to the churches at Philippi and Colossae and his private letter to Philemon. This study probes into the character of Ruth, her extraordinary relationship with her mother-in-law Naomi, and her endearing love with Boaz. In this study of Ruth, you will find strength to face the future, perseverance when you are in the valley, a lesson on loving, caring and trusting. This is a must for all ladies. 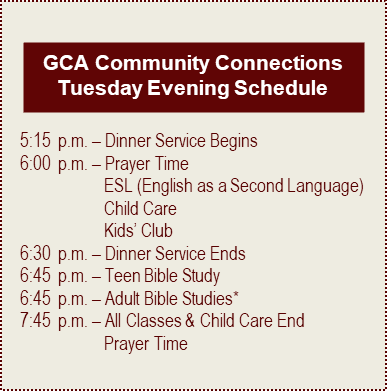 GCA Community Connections is open for registration. Registration is required to properly plan for meals and other programs we provide. Please register, spread the word, and join us in prayer that God would use this program to bring great glory to His name.